Marginal-marine deposits of the Fox Hills Formation have an intertonguing relationship with the overlying Lance Formation (Connor, 1991) and laterally with the Lewis Shale (Asquith, 1970). The Fox Hills-Lance contact is gradational and is defined as the transitional interval from upward-coarsening, progradational, marine sandstone wedges and aggradational sandstones with blocky and upward-fining log responses. In the Powder River Basin, shales in this transitional interval vary from less than 20 ft (<6 m) in proximal depositional settings in the north part of the basin, where they pinch out with sandy sequences, to as much as 150 ft (45.6 m) in thickness toward the south (Connor, 1991, his plate 3). However, the top of the Fox Hills Formation in the Powder River Basin and other basins in Wyoming is not a single shale bed, but multiple shale beds overlying several progradational Fox Hills sandstone wedges that pinch out into the Lewis Shale. These shale beds range in continuity from less than 3 mi (<4.8 km) in the proximal part of the Greater Green River Basin, to more than 10 mi (>16 km) in the distal part of the basin (Asquith, 1970, his fig. 20). 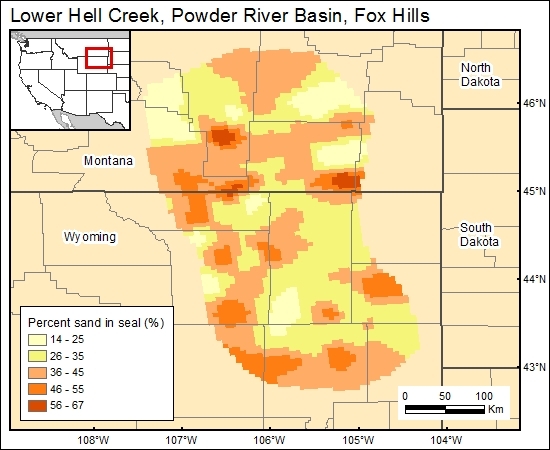 A percent-sandstone map of the Upper Hell Creek Confining Layer (Lewis and Hotchkiss, 1991) shows great variability in the sand content of the Fox Hills top seal, but locally high values of more than 70 percent sandstone occur in the north part of the basin, and lower percent-sandstone values of less than 40 percent are more common in the south part of the basin, where individual sandy Fox Hills progradational wedges pinch out into the Lewis Shale. Asquith, D. O., 1970, Depositional topography and major marine environments, Late Cretaceous, Wyoming: American Association of Petroleum Geologists Bulletin, v. 54, no. 7, p. 1184–1224.